1. 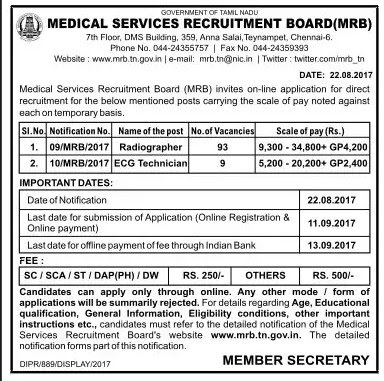 Radiographer - Must have passed two years Diploma course in Radio Diagnosis Technology conducted by the Board of Para Medical Education under the Directorate of Medical Education, Government of Tamil Nadu at Government Medical Institution or from any other Institution recognized by the Government of Tamil Nadu for this purpose. 2. ECG Technician - i) Must have passed PUC under old regulations; (or) A pass in Plus 2 course with eligibility for University course of study. and ii) Must have passed one year certificate course in Electro Cardiogram or Treadmill Technician conducted by the Government of Tamil Nadu.